“RTFM” (read the friggin manual). These are just a few of the “blame the customer” type of comments that I read on various drone forums. The comments are often directed at fellow pilots who come onto those forums to report crashes and ask what they may have done wrong. Getting past the rude behavior of the respondents, let’s discuss crashes of modern drones and who or what may be at fault. Toy Drone, FPV Racing Drones, etc. First, let’s dispense with the very basic quadcopters typically priced from $20-$250. These are not truly “drones” in the proper use of the word since they ARE manually controlled by the operator. Reliability of these types of devices varies greatly and the unskilled operator is likely to crash…early and often! It can be summarized that, in most cases, the crashing or loss (fly away) of this class of machines are due to one form or another of operator error. This may be a lack of judgement such as flying on windy days and/or in close proxity to obstacles…or simply a lack of basic piloting skills. The same logic applies to most DIY (building a drone from parts) situations. There are too many variable involved in the parts, labor, design, etc. to hold the manufacturers liable for the mishaps. The more sophisticated consumer drones available today sell for $300 – $2000+ and usually contain a stabilized camera as well as number of sensors and flight aids including GPS. 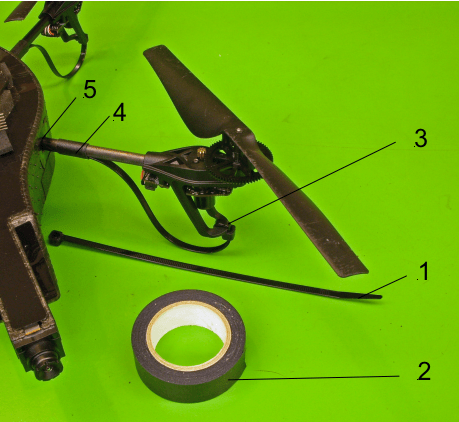 Here is an article explaining the basics of what makes a camera drone fly. These machines are flying robots…a combination of computers and mechanical devices which, when properly combined, can make safe and reliable flight a possibility. Unless you are living under a rock, you’ve probably heard about the new (US) FAA requirement that all drones over a certain weight (250 grams – a bit more than 1/2 pound) need to be registered. Registration is easy and cheap and each pilot – NOT each drone – needs to register. The FAA has announced 300,000 registrations as of mid-January 2016. This number then begs the question – how many drones are not yet registered? Or, more accurately, how many drone owners (pilots) who are actively using their machines have yet to register? No truly accurate numbers exist – your guess is as good as mine…or that of the paid “experts”, so let’s have some fun and flush out the numbers. Note – many of the numbers can be estimated by studying the statements of various manufacturers, Amazon.com sales, etc – put together with some other criteria, this may give us a glimpse of a moving target. The commonly reported numbers often include toy drones. They also don’t take into account multiple drone ownership by a single individual or loss/crash/retirement of drones. Without further ado, here is my guesses and the logic behind them…. So – you and LOTS of other people are interested in entering the hobby, business or pursuit of drones (quadcopters, UAV’s, multirotors, etc.)…. In fact, google now will autofill the query “I want to buy a ….” with the most desire products – as in the screen shot below! It turns out people desire houses, stocks, cars and drones….in that order! Lots of people want to Buy a Drone these days! Another indicator of the interest in Buying a Drone is the chart on Google Trends – the following shows the general trending of the term “drone” in searches, news stories and other indicators. Surf online for information about Buying a Drone and you will literally find millions of words and thousands of opinions on the subject. Most of them are useless or will steer you wrong. This article will attempt to steer you in the right direction as simply and economically as possible. To that end, it contains an Express Version and then a longer version with more detail and links. The Express Version of How to Buy a Drone should do for 80% or more of potential buyers. Amazing! Now you can sit indoors by the fireplace and get some idea of what it is like to fly a Parrot AR Drone! The new app is available both for Android and IOS and costs less than $2.50. This makes it a inexpensive investment for any newbies thinking of getting into quadcopter flying. Although the app is by no means perfect, it does represent a decent value and will at least you some indication of how your real AR can be controlled. The app offers various scenarios, including indoor (large warehouse) flying and outdoor as well as a mock-up of the official Parrot Race course for the finals in Las Vegas! You can adjust the point of view as being from the ground (on takeoff) or being the front camera or the bottom camera on the AR Drone. I’d like to see telemetry added so that an on-screen counters show you speed, height, battery life, etc. 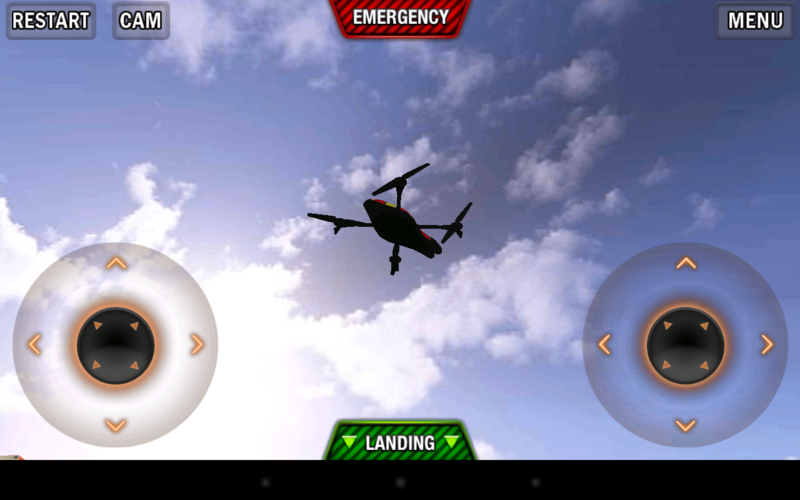 The app is named AR Drone SIM and is written by Dangerous Derk Interactive. The Android Version is at V 3.5. You can find it by searching the Google Play Store or the App Store on Apple devices. The market is VERY dynamic and we expect many more names to be added to this list, but for starters here is a list of some of the current manufacturers of consumer-grade ($25 -$2500) Multirotors. If you have any to add, please let us know by email. Note – the reason this does not contain links to the makers is that many either don’t have sites or the sites are very confusing (Chinese sites with thousands of toys on them and maybe 4 quadcopters). Use google or your search engine of choice to search for each type – adding “quadcopters” after the name. Example: search for “Syma Quadcopters”, etc. 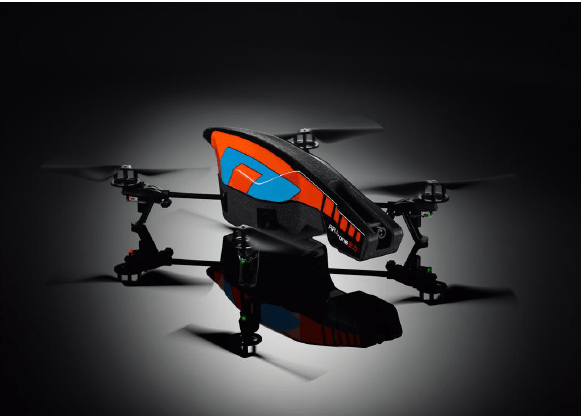 The AR Drone is a four-rotor aircraft which combines many of the new and advanced technologies in R/C Flight. Parrot, the company behind the AR Drone is marketing the AR Drone as a “flying video game” since it combines actual flying of the aircraft, real time video streaming to the controller, and the ability to add real-time gaming with hunter-seeker style gaming. The newest model, 2.0, is a vast improvement on the original and is a great learning platform for those seeking to find out about the new world of multirotor aircraft. 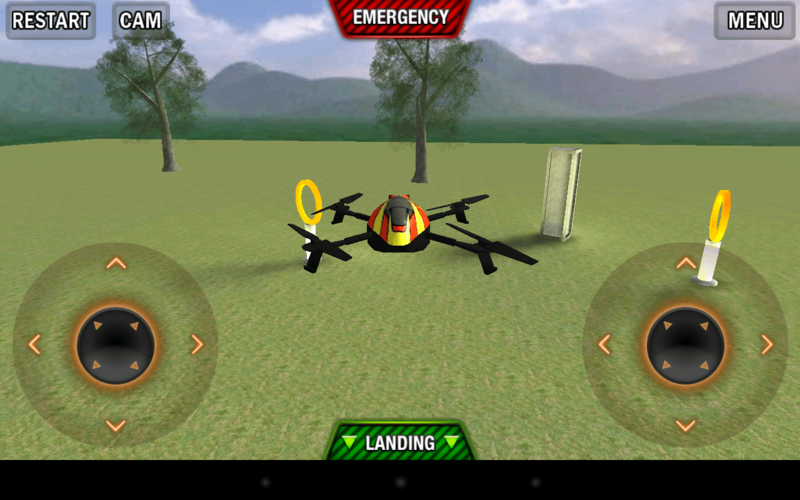 Unlike the current crop of low-budget helicopters, the AR Drone is controlled by your iPhone/iPad/iPod Touch or Android device via the AR Drone’s built-in WiFi system. The plus side of this system is that the cost of including a radio transmitter is eliminated but the downside is you are limited to the range of 802.11G Wifi signal which is about 150 feet. The AR is a “smart” drone and will be relatively easy to fly for beginners as it has advanced controls and software which do not require as much dexterity and practice as with atypical 2.4 GHZ radio controlled aircraft. 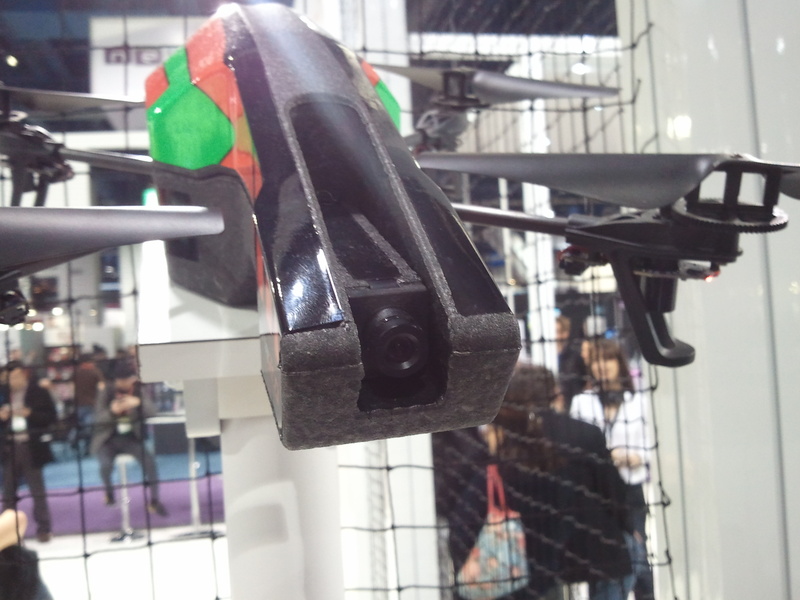 The AR Drone ships with an indoor hull that provides foam padding to protect the rotor blades during the inevitable bumping into things when flying indoors. However, in reality, this machine is not designed for indoor flying except in very large rooms. Our suggestion at Droneflyers is to use the AR Drone as an outside quadcopter. Also included is an outdoor hull which is lighter weight providing faster speeds and slightly longer run times. 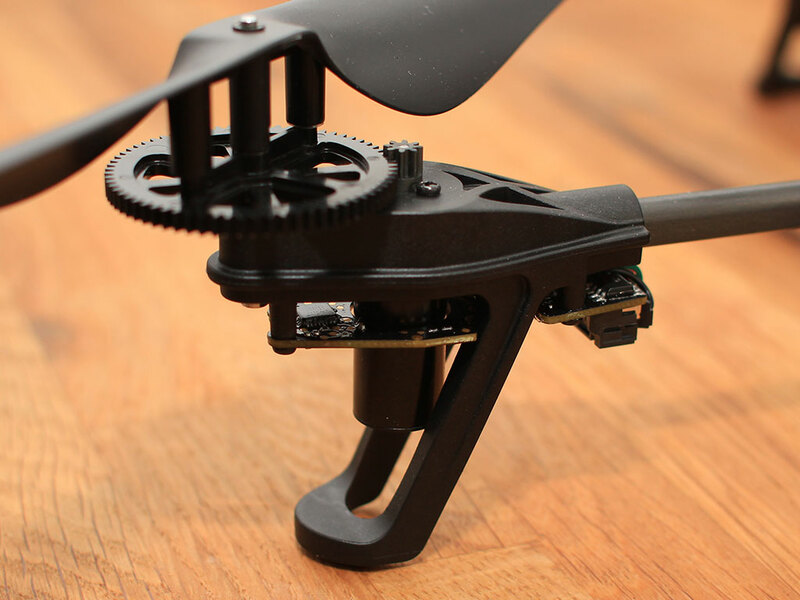 The AR Drone features a 3-axis accelerometer as well as a 2-access gyroscope. The sonar provides altitude stabilization up to about 20 feet. Above the range of the ultrasonic sonar, the drone goes into a blind-flight mode that requires more control input to maintain height. Radio range is limited by WiFi communication distance to about 150 feet. 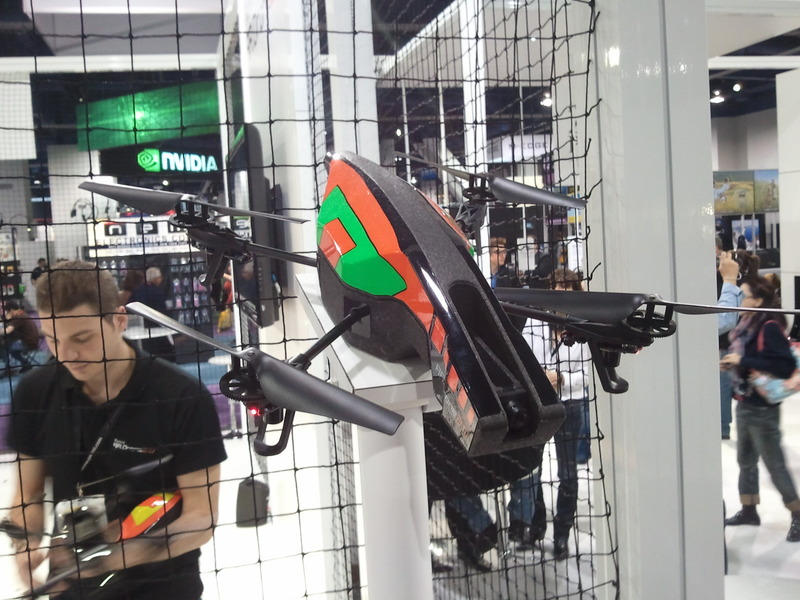 The AR Drone 2.0 is outfitted with two color cameras. The front camera is HD resolution (720P) at 13 frames per second. The downward looking camera is QCIF resolution (176 x 144 pixels) at 60 frames per second. The AR Drone is available from Brookstone, Amazon and other sources for about $300. This site will continue to provide you with up-to-date information, news, modification, hacks, and more. Note – if you want to get started in the world of Quadcopters and Multirotors at a much lower price point, consider a model like the Syma X1 or similar sub-$60 models. You certainly will not get the cameras and all the advanced features of the AR Drone, but at the same time you may not cry as loudly when you lose your first quad up in a tall tree! 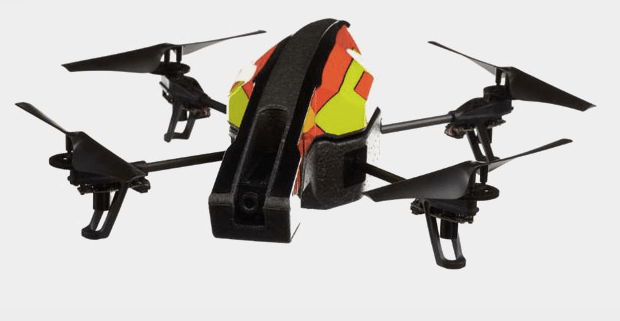 Parrot has already announced the AR Drone 2.0 but has taken it to a whole new level with a completer website dedicated to the AR Drone 2.0. The new website features videos, photos, and more in-depth information on some of the new changes.